July 23, 1994, LG Crabo & J Troubridge. Euxoa ochrogaster is a variable light yellow-brown, orange-brown, or red-brown medium-sized Euxoa (FW length 16–19 mm) with several distinct forms that usually have pale ochre lining and dark gray filling of the reniform spot and dark gray terminal area that flies in variety of habitats throughout our region during the summer. The forms can be divided into two basic types, one with a dark cell and light costa and one with more uniform color. The first form is warm light brown, lighter ochre-brown or orange-brown near the posterior margin, in the subterminal area, and at the apex. The costa is paler grayish ochre, lightest colored at the base, and the cubital vein is similarly pale to the reniform spot. The cell is filled with black, and there is a thick black basal dash. The terminal area is dark gray. The lines are relatively indistinct, usually evident as spots on the costa. In addition, the antemedial line is visible on the mid-wing, the toothed postmedial line is evident as the transition between the darker median and lighter subterminal areas, and the sinuous subterminal line is light tan or ochre. The more solid forms are colored even red-brown, powdery gray-ochre, even orange-brown, or blackish brown with a red-tint. The transverse lines are more variably in this form, usually most prominent as double gray lines in the powdery gray-ochre form and relatively faint in the other colored forms. The terminal area is usually dark gray, and the pale subterminal line is evident. This line is often preceded by a dark gray spot on the costa, a gray to brown shade elsewhere, and occasionally by gray wedges on the mid-wing. The orbicular and reniform spots are partially outlined by dark gray outer and light ochre inner lines and are present in all forms. The orbicular spot is round or weakly oval, often lacks the outer dark line, but usually has central filling of the ground color or gray. The reniform spot is kidney-shaped, moderate-sized, and is more consistently filled with dark gray, darkest at the lower end. The claviform spot is black and prominent in the contrasty form with dark in the cell, but is absent or very weak in the evenly colored forms, The hindwing is pale gray-tan with darker gray on the outer third, veins, discal spot, and terminal line. The hindwing fringe is white with a striped ochre and gray base. The head and thorax match the foreiwng, red-brown, gray-ochre, orange-brown, or black-brown. A frontal tubercle is present. The male antenna is biserrate. Euxoa ochrogaster is placed in the large subgenus Euxoa. This moth can often be recognized despite its many seemingly different forms by the combination of a warm ground color ranging from ochre to red, ochre-lined and gray-filled reniform spot, and dark gray terminal area. The form of E. ochrogaster with a light costa and extensive black markings resembles the similar form of Euxoa perexcellens. 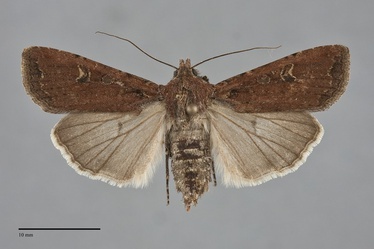 Euxoa ochrogaster is less stout with a narrower forewing and lacks a pale yellow-brown streak in the fold distal to the claviform that is present in E. perexcellens. The gray-ochre and orange-brown forms of E. ochrogaster resemble Euxoa nostra, but it is more orange in color, has a gray or pale tan costa, and has an oval orbicular spot that lacks peripheral light lining. The reddish form of E. ochrogaster resembles Euxoa mimallonis, Euxoa excogita, andmales of Euxoa adumbrata. 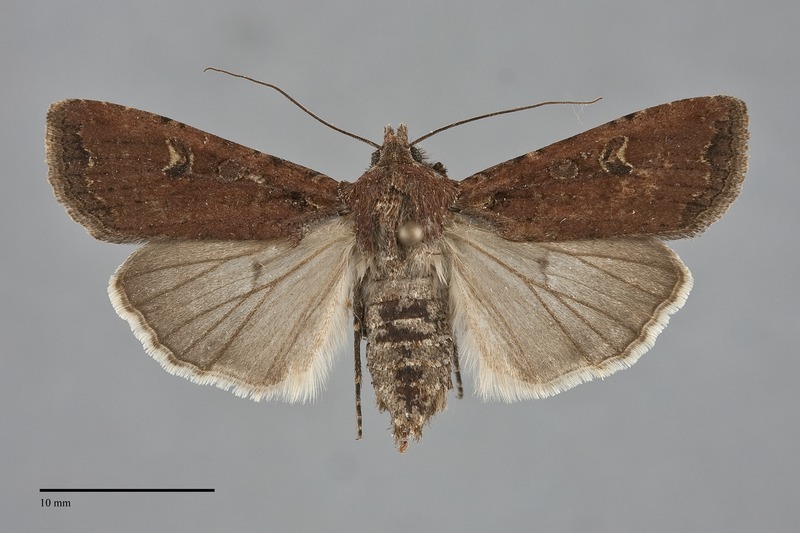 The male of E. adumbrata have a lighter two-toned hindwing than E. ochrogaster. 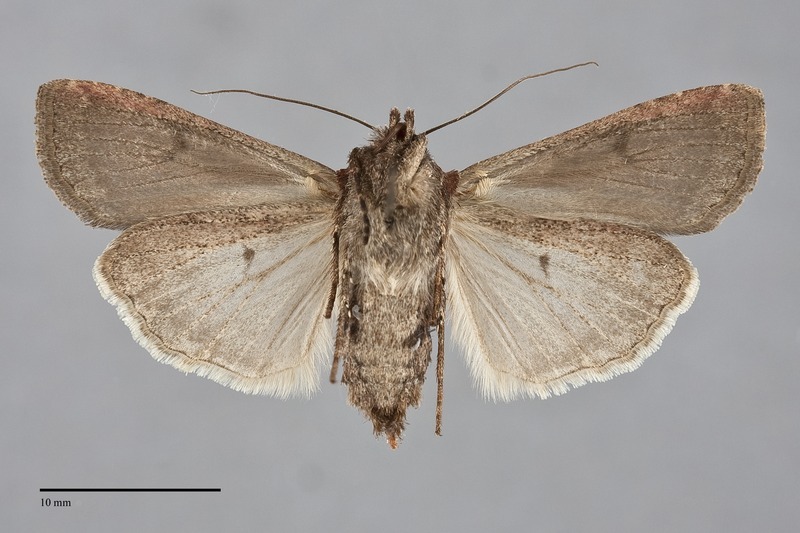 Structurally, it has a spoon-shaped tip to the right saccular extension, tapering to a point in members of the subgenus Euxoa, which can be observed under magnification after brushing the scales away from the tip of the abdomen with a fine brush. Euxoa excogita is very close in color to E. ochrogaster, but lacks circumferential pale lining of the spots and the gray central filling. Also, its subterminal area is less contrasting without the dark gray color of E. ochrogaster. The red form of Euxoa ochrogaster has a much darker hindwing than the nearly white one of E. mimallonis. Finally, the black-brown form of E. ochrogaster resembles females of E. adumbrata. The color of E. adumbrata tends to more somber, with less red in the ground color and paler filling of the spots. The abdomen is dorsoventrally flattened in this species, normally cylindrical in E. ochrogaster. 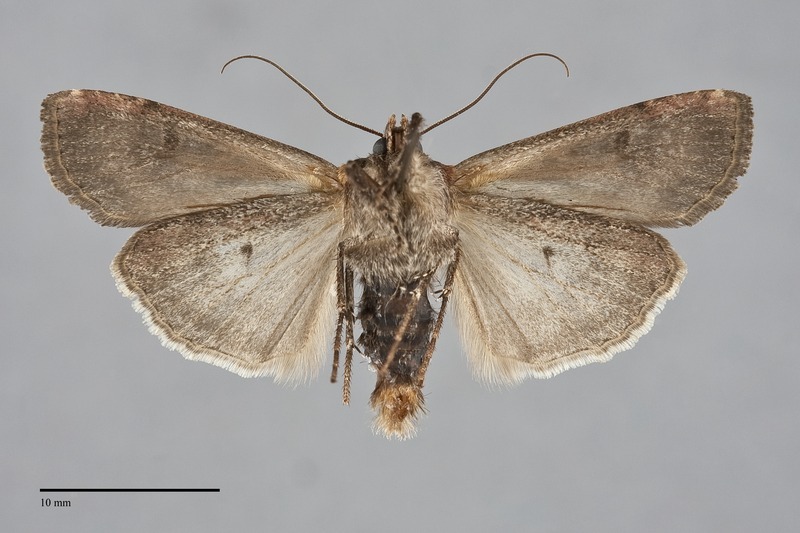 Collectors in northeastern British Columbia should be on the lookout for a similar but grayer moth, Euxoa cursoria. It has been collected in sandy habitats in eastern Alberta and Northwest Territories. 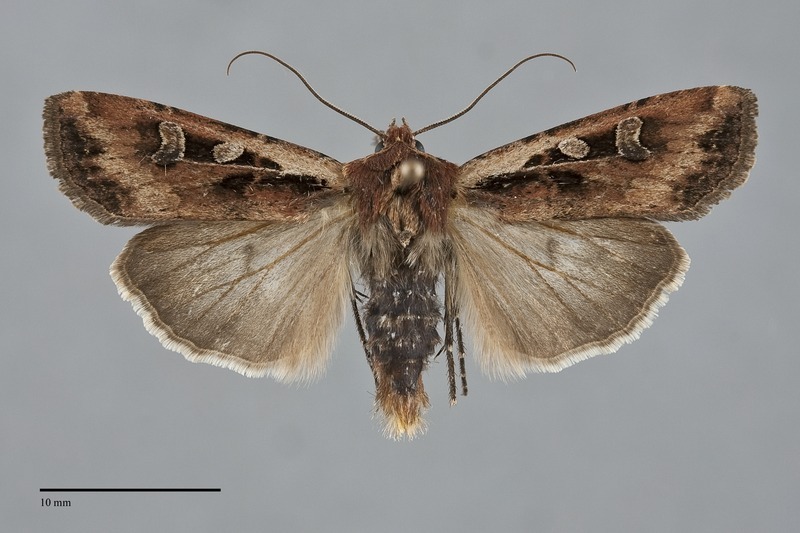 This species is arranged in three subspecies but only the nominate subspecies is found in North America. This species is widely distributed in dry, open habitats across the northern regions of both Eurasia and North America. In the Pacific Northwest, it is moderately common on open sagebrush steppe at low elevations east of the Cascades during wet years, but is often less common during drought years. It is also uncommon in juniper woodlands and ponderosa pine forests at middle elevations east of the Cascades in Oregon. It is more common further north in British Columbia where is flies in a variety of boreal and montane forest habitats. Euxoa ochrogaster is a major agricultural pest in herbaceous crops east of the Cascades, and frequently builds up into massive epidemic outbreaks in such disturbed habitats. Euxoa ochrogaster is widely distributed throughout most of the Pacific Northwest, although it does not occur in the most xeric steppe habitats. It is found uncommonly west of the Cascades in Oregon and Washington. This species has a Holarctic distribution and occurs across Eurasia to Scandinavia. It is also widely occurring in the New World, ranging across the boreal zone from Alaska to New England. The southern limits are the Pacific Northwest along the Pacific coast, Arizona and New Mexico in the Rocky Mountain region, and the states adjacent to the Canada-United States border in the Midwest and East. 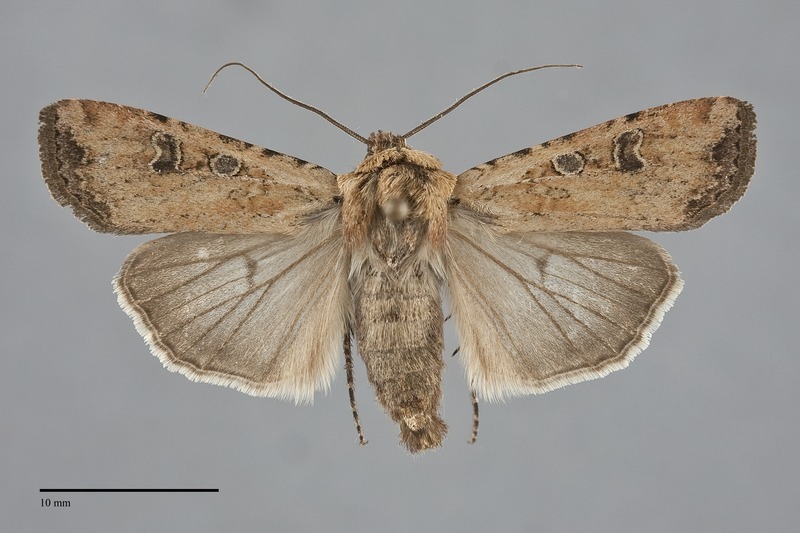 This species is a soil-surface feeding cutworm that feeds on general herbaceous vegetation in such families as the Fabaceae, Asteraceae, Lamiaceae, and Brassicaceae. During epidemic outbreaks, it may also cause major damage to grass crops (Poaceae). Adults occur in late summer, most commonly from mid-July through August. They are nocturnal and come to lights. 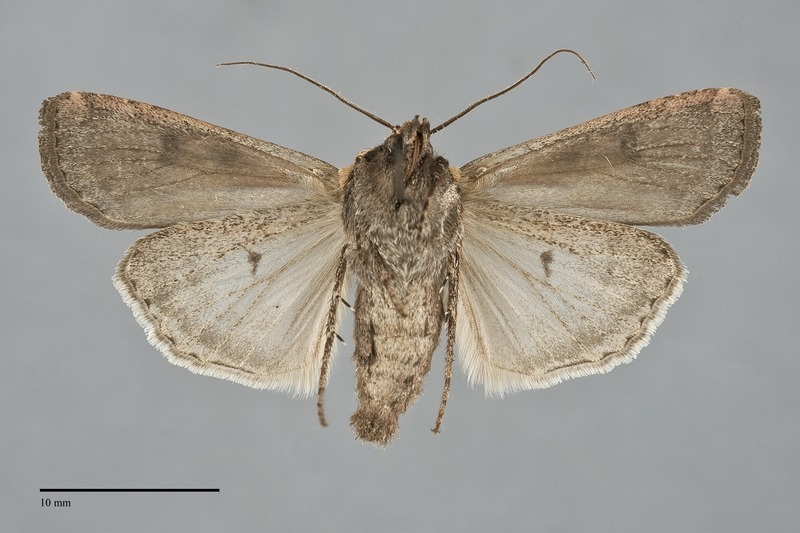 This species is a major agricultural pest species in the Pacific Northwest, and has caused extensive damage to crops of peppermint and alfalfa east of the Cascades.